~10, depending on the size of your ham. 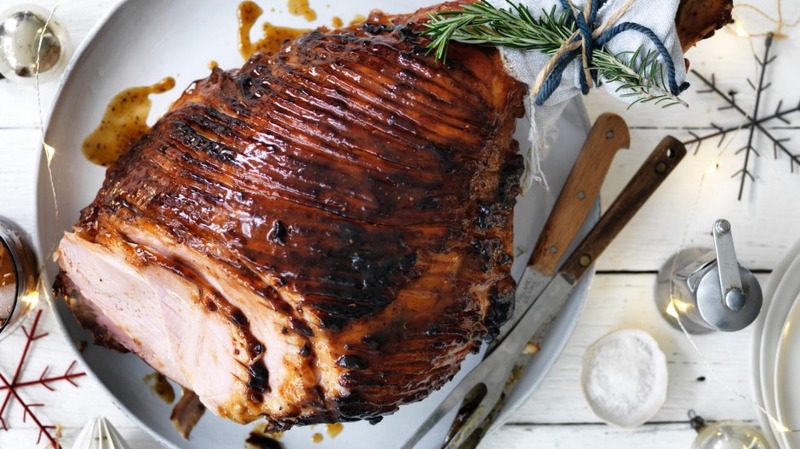 A ham glaze needs to have a balance of sweet and sour to offset the salty ham, but the key is a lug of something savoury, like soy sauce, so that it doesn't taste like a jam. 1. Heat your oven to 180C (160C fan-forced). In a small pan, toast the coriander seeds and black peppercorns until fragrant then grind to a coarse powder with a mortar and pestle. 2. Return the pan to the heat and add the peaches, sugar, soy sauce and white wine. Simmer for 5 minutes until the peaches break down. 3. Puree with a hand mixer and stir through the lemon juice and olive oil. Remove the skin from the ham and score the fat. 4. Brush liberally with the glaze and roast for about 1½ hours (for a 6kg ham) to 2 hours (for an 8kg ham), brushing with more glaze every 20 minutes or so until the ham is sticky and warmed through.